A current FAQ is how to drive the command line hammerdbcli from an external bash script. This post gives an example of one way which this can be done. echo "BASH SCRIPT BEFORE BUILD.."
echo "BASH SCRIPT AFTER BUILD.."
If you run the bash script it will now call hammerdbcli that will run buildora.tcl, this will wait until complete to call exit before returning control back to the bash script. This is just one example of many ways in which hammerdbcli can be blended with Tcl, bash or even Python to automate HammerDB functionality. 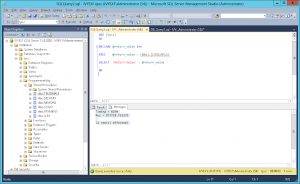 If it is needed to strip the control characters from the output this can be done using sed. The stdbuf command can also be used to write the output line by line to the output file. 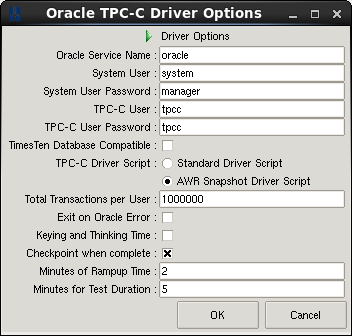 An essential part of database performance testing is viewing the statistics generated by the database during the test and in 2009 HammerDB introduced automatic AWR snapshot generation for Oracle for the TPC-C test. With this feature Oracle generates a wealth of performance data that can be reviewed once the test is complete. 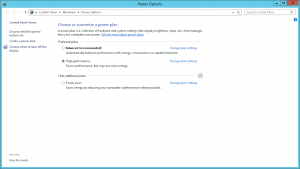 However what if you want to review performance data in real time as the test is running? 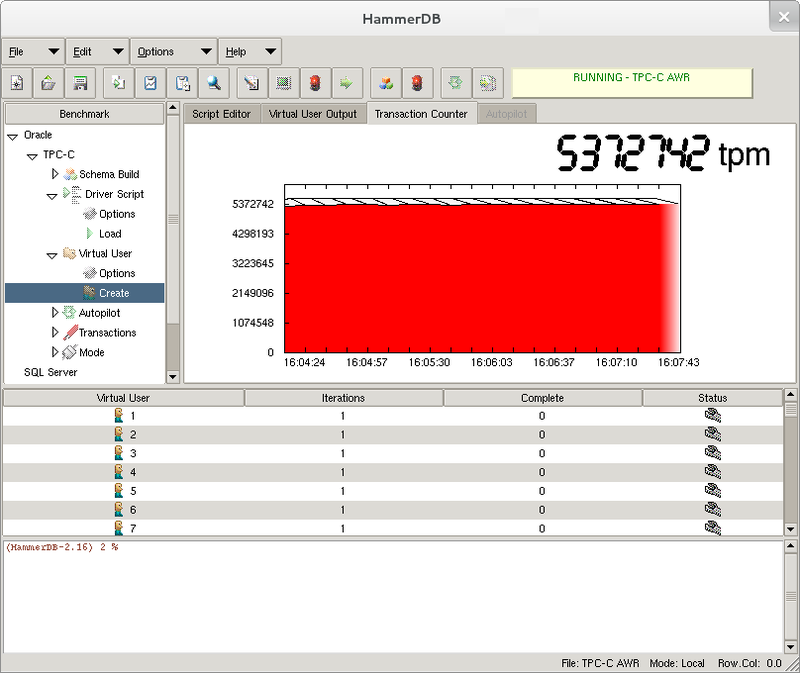 With HammerDB 3.1 you can now do that with Oracle Metrics. Before introducing how this works it is important to acknowledge the ASHMON tool from which this functionality was adopted and more importantly its author Kyle Hailey for giving permission to add it as open source. 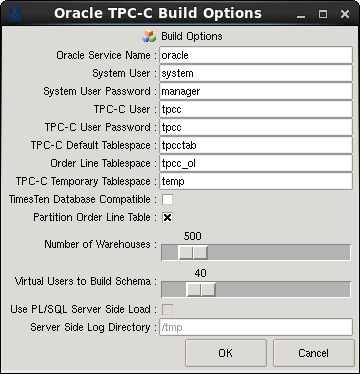 To get started with Oracle metrics use the previous option for CPU metrics that now shows the service name and system user and password. 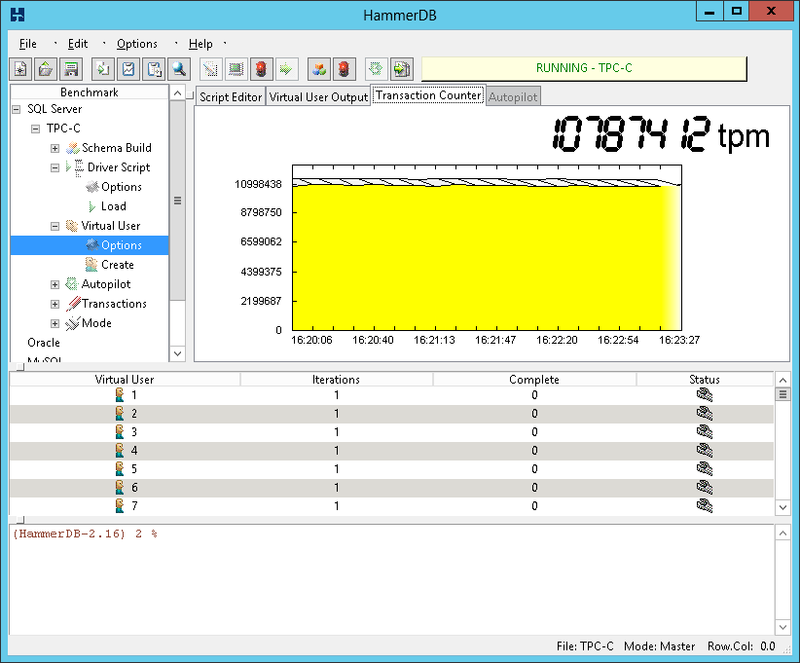 With these filled out click the metrics button and once connected to the Oracle database the metrics window will appear embedded within HammerDB. you can either resize the window embedded using the grab bar or you can grab the tab at the top of the notebook that says Metrics (with the arrows indicator) and drag the window out to be standalone (closing the window embeds it again). 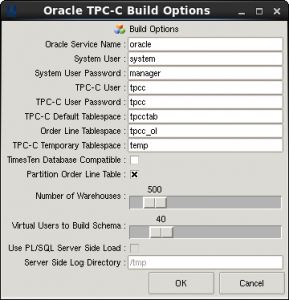 As this feature uses the Oracle Active Session History, use the mouse to highlight a timeframe of interest and the SQL, wait events and users will appear in the panes to the left. 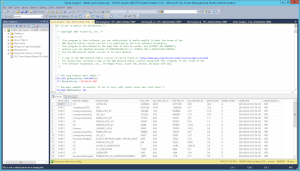 On the right you have the choice of displaying the sql text, explain plan, io or statistics. 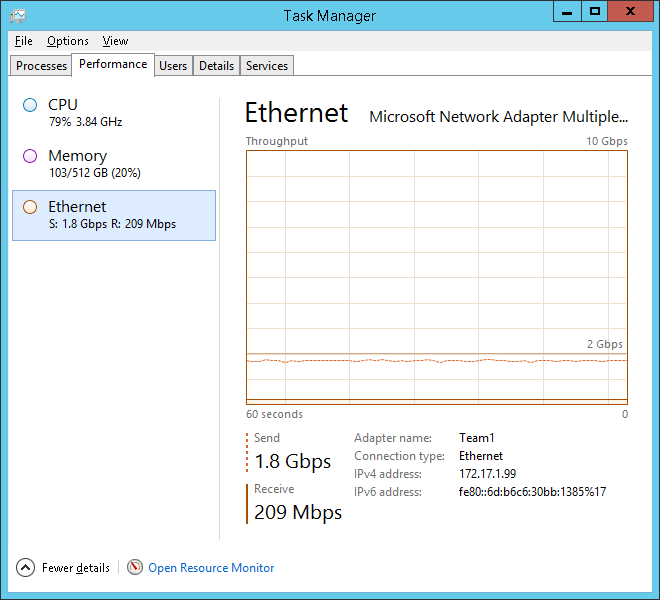 The CPU option allows you to view the original live CPU metrics window. 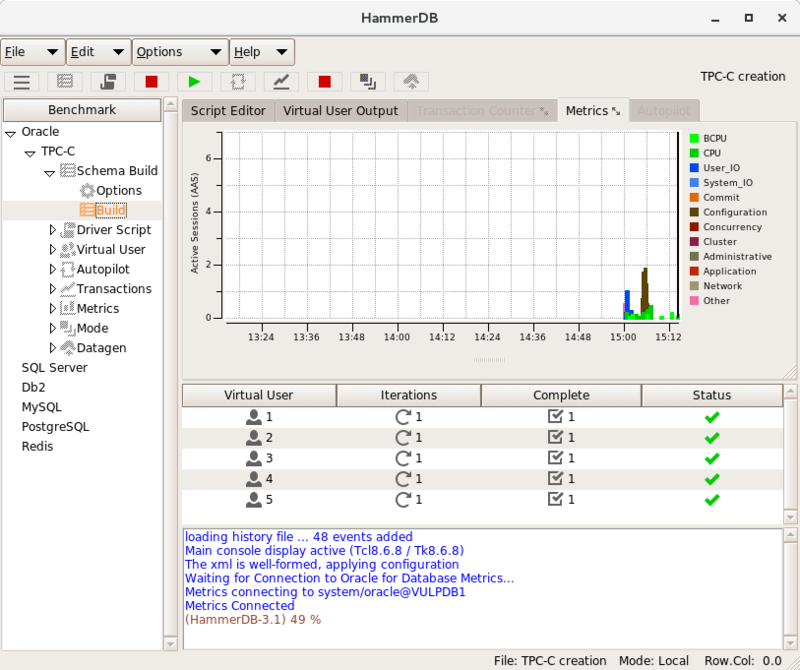 It is clear from the window below that HammerDB was running a schema build and the top wait event was log file switch (checkpoint incomplete) – time to resize the redo logs or move them to faster disk! 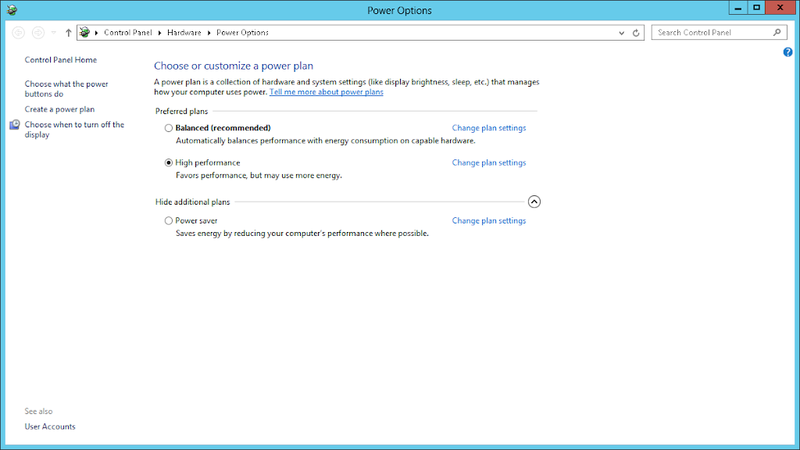 Running a TPC-C performance test information can be viewed live (by not selecting an area) or by highlighting the area of interest. 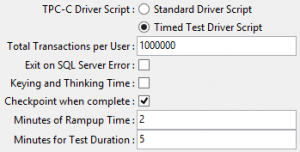 In this example a test with 2 minute rampup and 5 minute test time can be seen. It is also clear that most significant wait event is “log file sync” and therefore tuning should focus on the redo log performance. 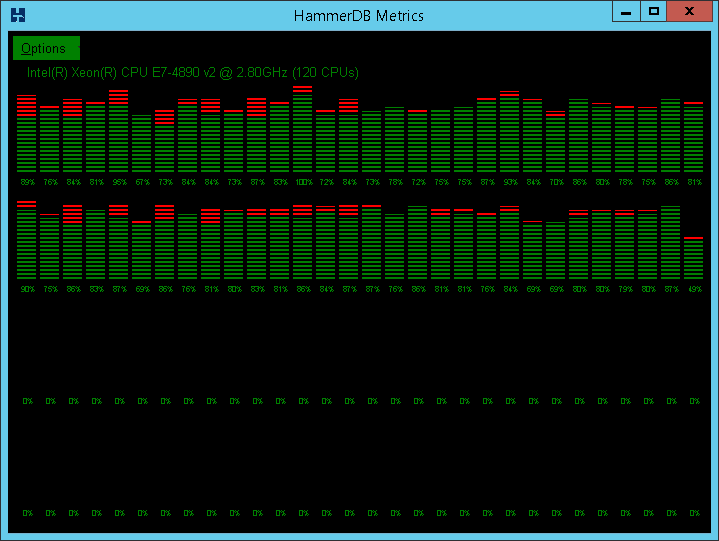 The user CPU is highlighted in green and the aim for maximum performance is for the top event to be CPU. 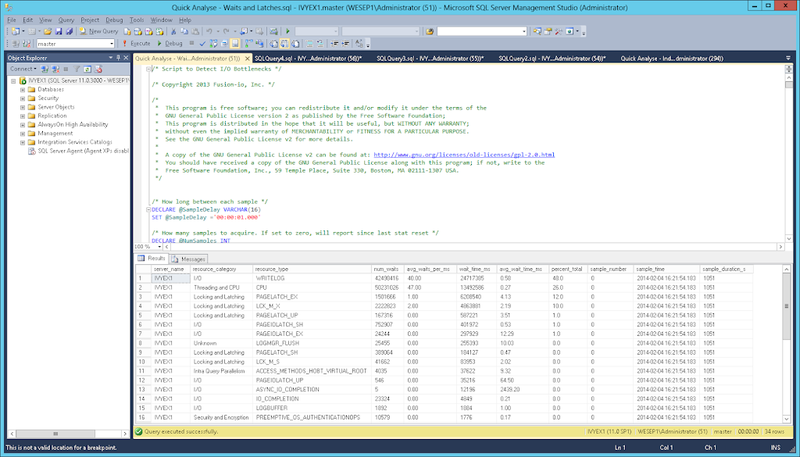 You can also drill down on particular SQL ID’s be double clicking on them that will highlight the related wait events and in this example the session showing the most “db file sequential read” is highlighted with the associated explain plan showing the index access that we would expect. All of this functionality is also available for the TPC-H workload as well so you can see the actual queries how they were run, the explain plans and the events. 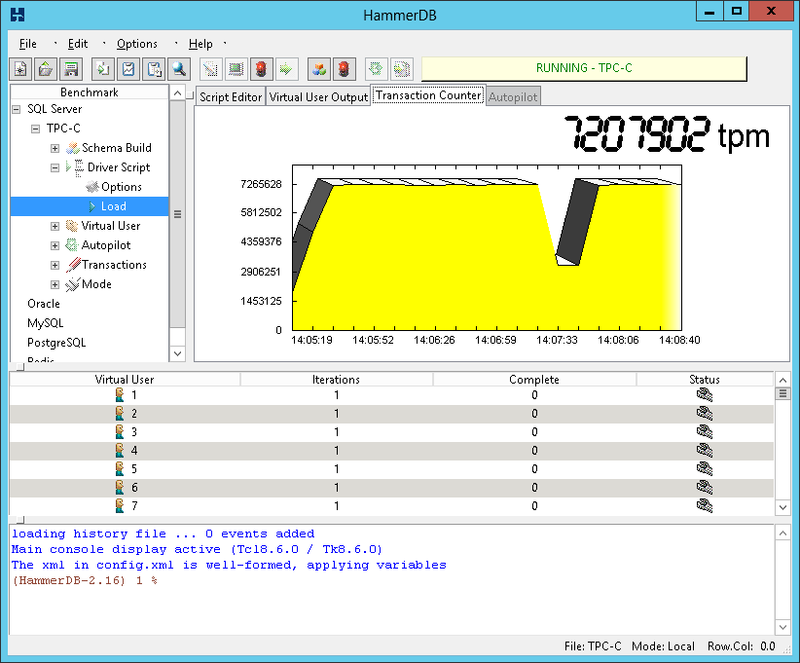 Finally like all HammerDB features everything that is available on Linux is equally available on Windows as well so if running an Oracle client on Windows you can access exactly the same features to monitor your benchmark performance in real time. This is a very typical FAQ and although detailed in the documentation some extra details may help in sizing and configuration. 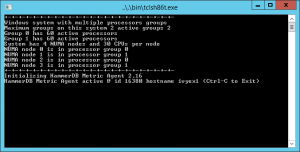 For a really quick answer create a schema with 250-500 warehouses per server CPU socket for more details size as follows. 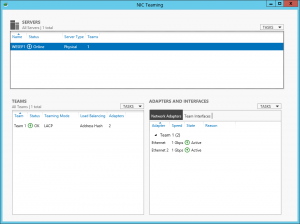 The official TPC-C test has a fixed number of users per warehouse and uses keying and thinking time so that the workload generated by each user is not intensive. 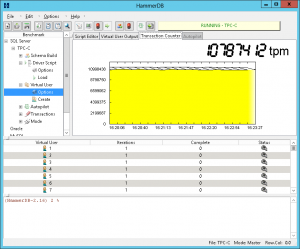 However most people use HammerDB with keying and thinking time disabled and therefore each virtual user can approximately drive the CPU resources of one CPU core on the database server. 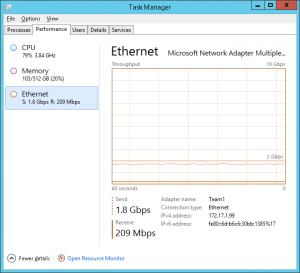 Therefore the relationship between virtual users, warehouses and cores can be seen, you need considerably fewer virtual users and warehouses to drive a system to maximum throughput than the official test. Additionally it is important to understand the workload. By default each virtual user has the concept of a home warehouses where approximately 75% of its workload will take place. With HammerDB this home warehouse is chosen at random at the start of the test and remains fixed. For example it can then be understood that if you configure a schema with 1000 warehouses and run a test with 10 virtual users by default most of the workload will be concentrated upon 10 warehouses. (It is important to note the “by default” clause here as there is an exception to change this behaviour if desired). Also with the home warehouse chosen at random it should be clear that number of warehouses should be configured so that when the maximum number of virtual users that you will run are configured there is a good chance that the selection of a home warehouse at random will be evenly distributed across the available warehouses with one or possibly 2 virtual users selecting the same home warehouse at random but not more. 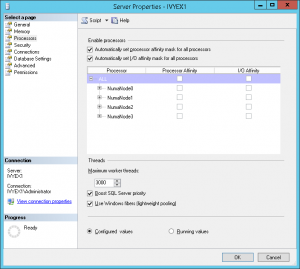 As an example configuring a 10 warehouse schema and running 100 virtual users against this schema would be an error in configuration as it would be expected for 10 virtual users or more to select the same warehouse. Doing this would mean that the workload would spend considerably more time in lock contention and would not produce valid results. Typically an option of 4 to 5 warehouses per virtual user would be a minimum value to ensure an even distribution of virtual users to warehouse. 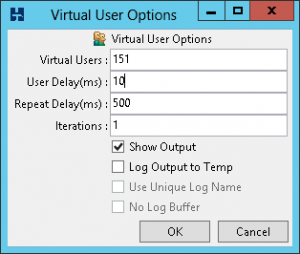 Therefore for the 100 virtual users 400 to 500 warehouses should be a minimum to be configured. 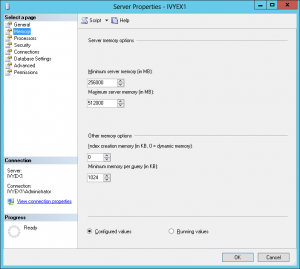 As noted configuring more should not have a major impact on results as depending on the number of virtual users used in the test most the warehouses will be idle (and ideally most of the warehouses you are using will be cached in memory in your buffer cache so the I/O to the data area is minimal). As one virtual user can drive most of the capacity of one CPU core the actual value for the number of warehouses you choose will depend upon the number of cores per socket. Note that if using CPUs with Hyper-Threading allow for additional CPU capacity, so size as if there were 35% more physical cores. Also depending on your chosen database some database software will not scale to fully utilise all cores, see the best practice guides for guidance on your chosen database. 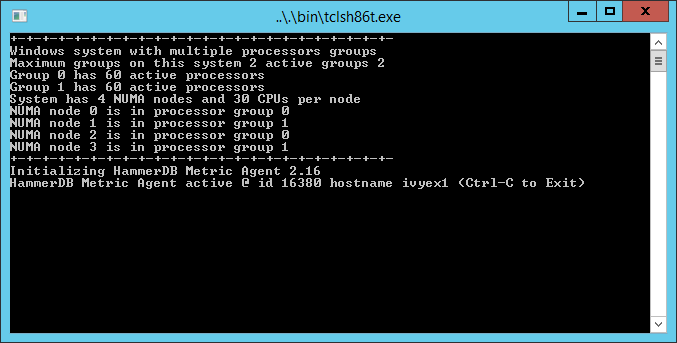 If CPU utilisation is limited then you will need fewer warehouses configured and virtual users for the test. It should also be clear that there is no completely accurate one-size-fits-all type guidance for warehouse sizing as different databases will scale differently and some may need more warehouses and virtual users than others to reach peak performance. A common error is to size many thousands of warehouses and virtual users with the aim of reaching high performance but instead resulting in high levels of contention and low performance. Even for highly scalable databases on large systems upper limits for tests without keying and thinking time are in the region of 2000 warehouses for up to 500 virtual users for maximum performance. There is one exception to the guidance above and that is when the “Use all Warehouses” checkbox is selected as shown. When this option is chosen instead of each virtual user choosing a home warehouse at random instead all of the available warehouses are divided between the virtual users and they then select a new home warehouse for each transaction. 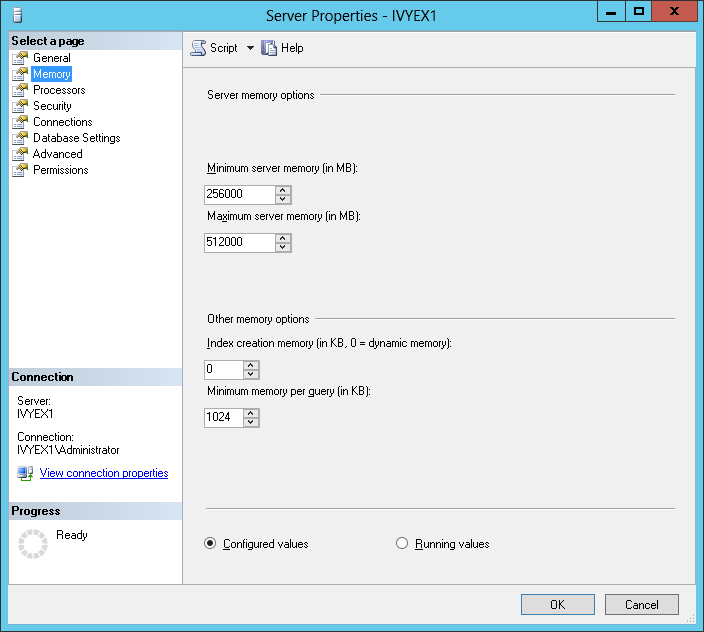 This option has been provided to increase the I/O to the data area and therefore when using this option you can choose to configure more warehouses with the knowledge that you will use them in contrast to the default option which will cache most of the warehouses used with the aim of reaching maximum performance and CPU utilisation. 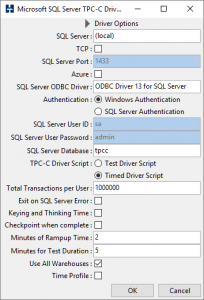 This post complements the previous best practice guides this time with the focus on MySQL and MariaDB and achieving top levels of performance with the HammerDB MySQL TPC-C test. As with the previous guides as an Intel employee (#IAMINTEL) the examples are taken from a MySQL 8 on Linux on Intel system and the approach is the same for whatever system you are testing although some of the settings you see may be different. 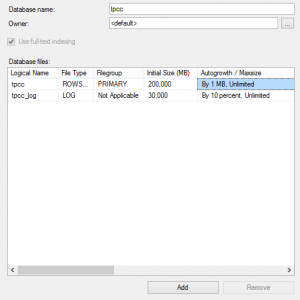 Similarly for this guide MySQL can be swapped for a mySQL based databases such as MariaDB. 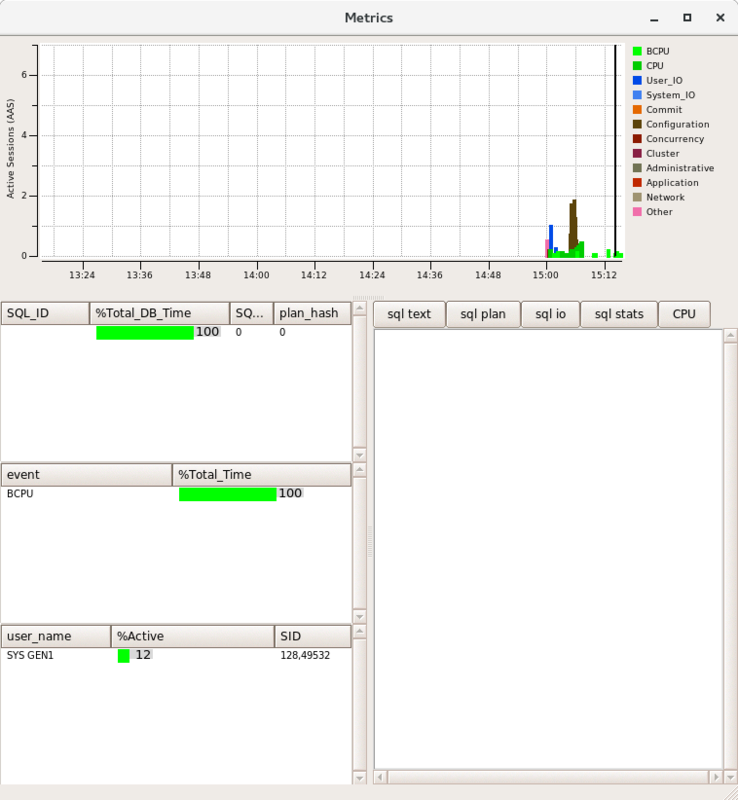 As is exactly the same with PostgreSQL for system choice a 2 socket system is optimal for MySQL OLTP performance. As is also the case this limitation is at the database level (especially the storage engine) rather than the hardware level. InnoDB is the storage engine that will deliver the best OLTP throughput and should be chosen for this test. 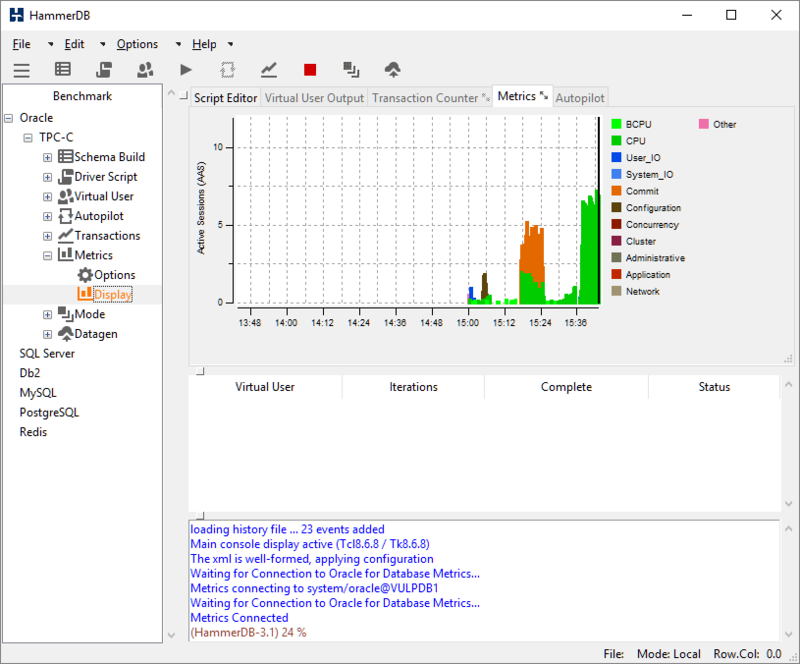 For anyone benchmarking MySQL with HammerDB it is important to understand the differences from sysbench workloads as HammerDB is targeted at a testing a different usage model from sysbench. 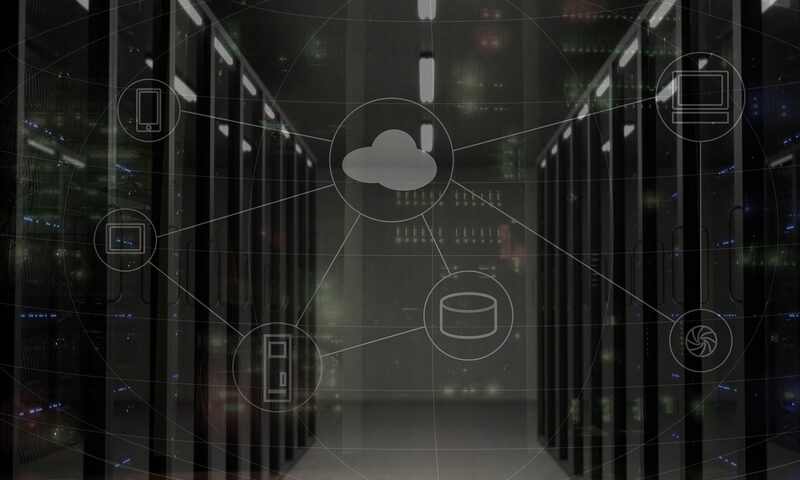 Historically MySQL has been positioned for supporting web-based applications this is in contrast to enterprise based database workloads that have been served by commercial databases such as Oracle, Db2 and SQL Server. 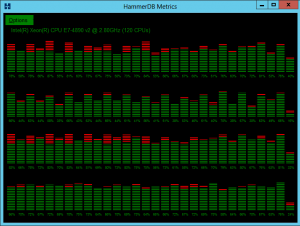 For this reason sysbench presents a vastly more simplified workload than HammerDB. 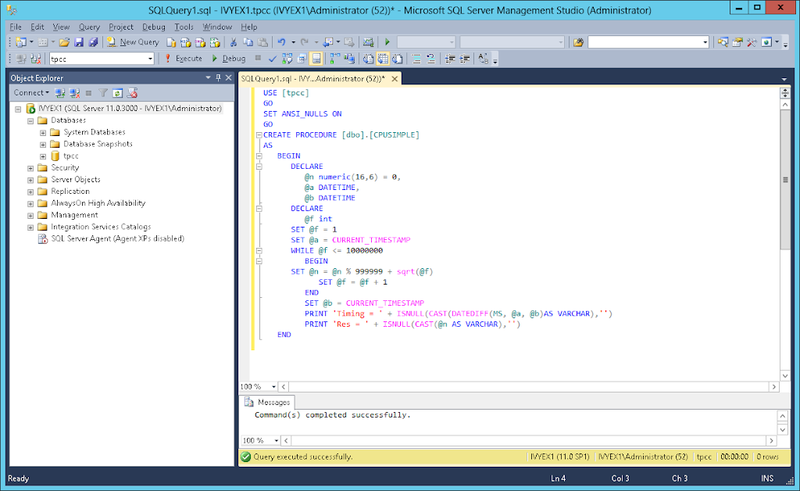 By default sysbench creates a single table with an ascending primary key and an identical pad column. SELECT SUM(K) from sbtest where id between ? and ? 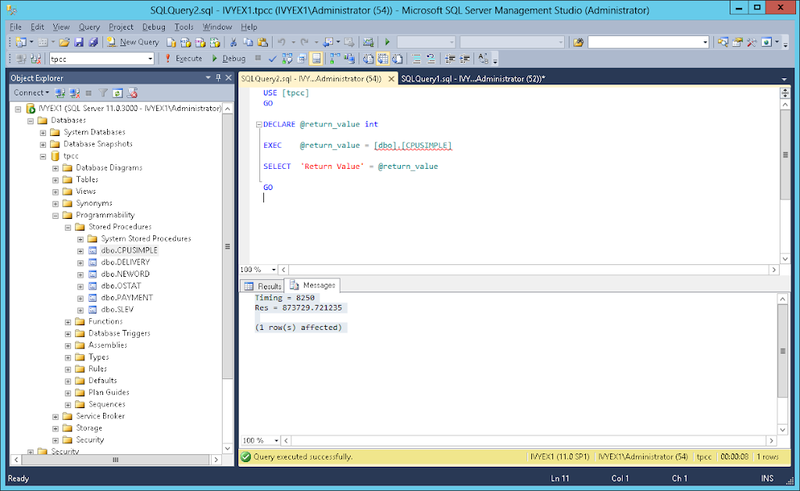 SELECT c from sbtest where id=? Consequently there is no contention and the workload will scale according to the ability of the database to handle these isolated statements. 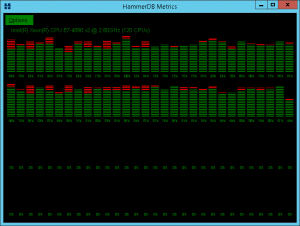 As a result there is deliberate contention in the HammerDB workload that is not seen in a sysbench one. 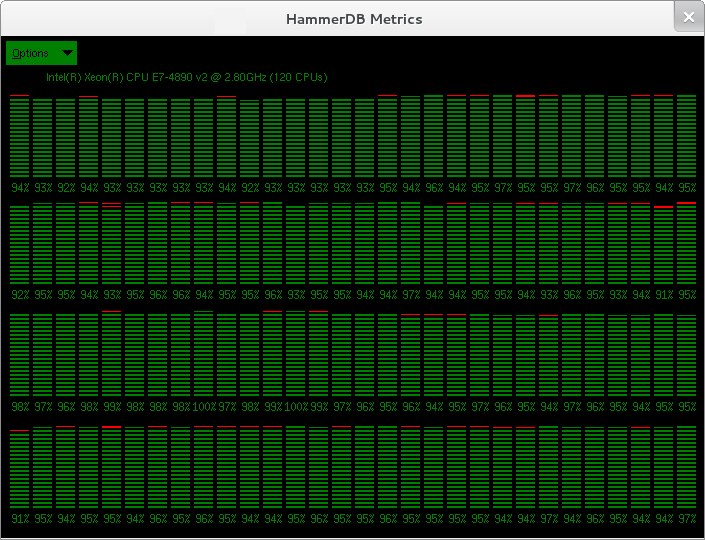 Also as HammerDB is making one call to stored procedure that then contains multiple SQL statements the workload throughput is significantly higher than sysbench. More recently MySQL and MariaDB has been positioned in the enterprise space competing with commercial database such as Oracle with features such as PL/SQL compatibility. 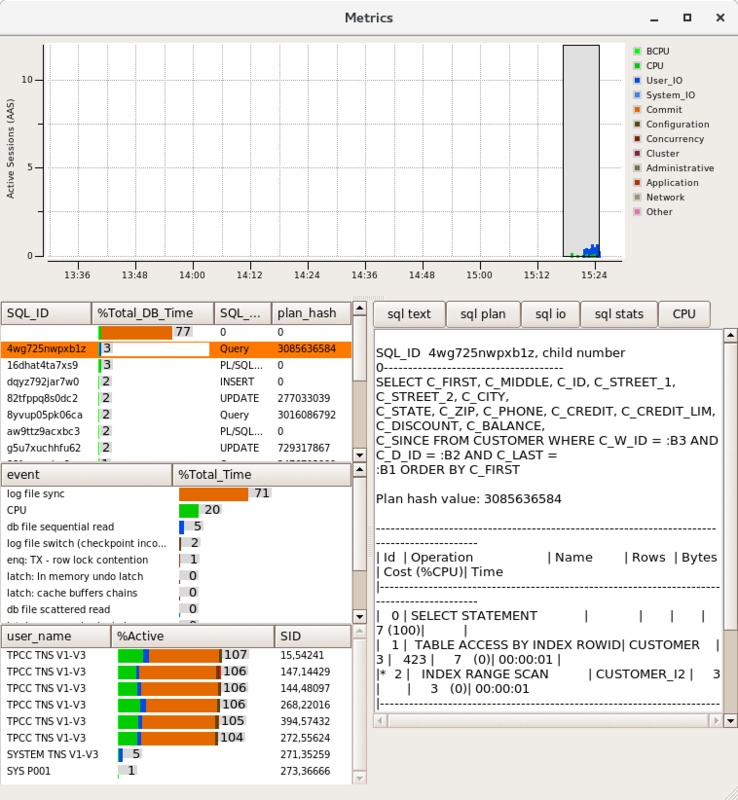 Therefore if you are testing MySQL or MariaDB’s ability to support web-based applications that use SQL statements with minimal contention then sysbench is likely to present the best assessment of the system for this type of workload. On the other hand if testing MySQL or MariaDB for the ability to handle a more complex workload such as the use of stored procedures and in particular if looking to compare scalability with a traditional database then HammerDB is focused more towards testing those enterprise features. Finally it is also important to note that this comparison is focused around OLTP based workloads, HammerDB also supports a TPC-H based workload for analytics with complex ad-hoc queries. Traditionally MySQL has not supported such workloads however features such as columnstore in MariaDB now make this possible. current policy: frequency should be within 1000 MHz and 3.80 GHz. Finally in testing Huge Pages has less of an impact than with PostgreSQL, although performance should not be lower than having Huge Pages disabled. 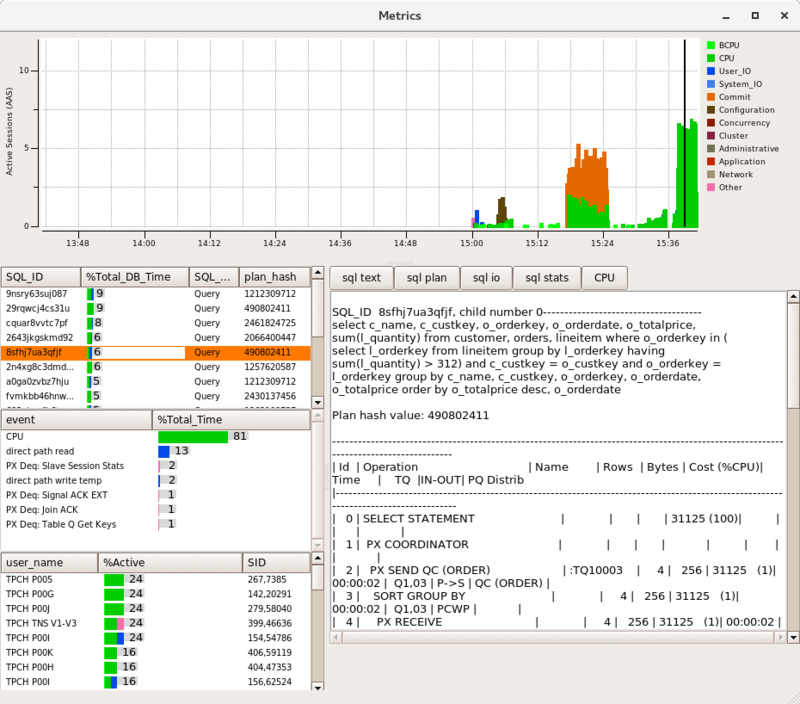 Just note that if using MariaDB in some versions a bug means that Huge Pages cannot be enabled although this does not greatly impact performance. The MySQL manual advises that building from source allows you customize build parameters and as with PostgreSQL this can also be the best way to achieve maximum performance. In particular with a workload such as HammerDB there is a lot of emphasis on locking and latching that is not seen in a sysbench workload and therefore you may see gains in modifying the InnoDB storage engine code. In InnoDB some of this behaviour is hardcoded however the CPU PAUSE instruction that is used by the UT_RELAX_CPU macro can and does vary between CPUs. In particular on Intel Scalable Processors (Skylake architecture) the PAUSE instruction is much longer than previous architectures and therefore calling UT_RELAX_CPU can consume a lot more time resulting in reduced performance. It may be the case that by the time you are testing this you can modify this behaviour with a parameter. Otherwise find the file ut0ut.cc in the directory storage/innobase/ut and modify the value accordingly, by default it is set to 50, for Skylake 5 is more appropriate for the delay multiplier. If unsure on whether to do this run the workload and use the perf command to observe the top functions. If “ut_delay” is consuming most of the CPU (in most cases it will still be one of the top functions) then potentially modifying this code can increase performance. 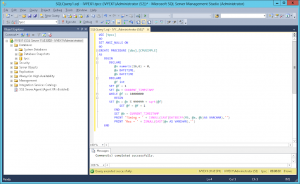 An example MySQL my.cnf file is shown. Note that innodb_file_per_table is set then when we use partition in HammerDB it can insert into multiple files one per partition. This gives a performance gain. 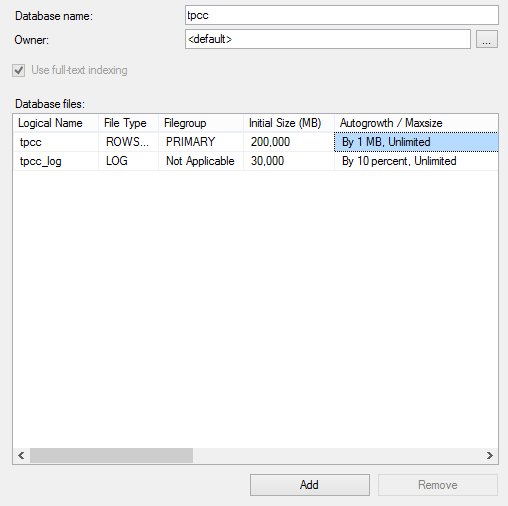 One configured start the MySQL or MariaDB database. 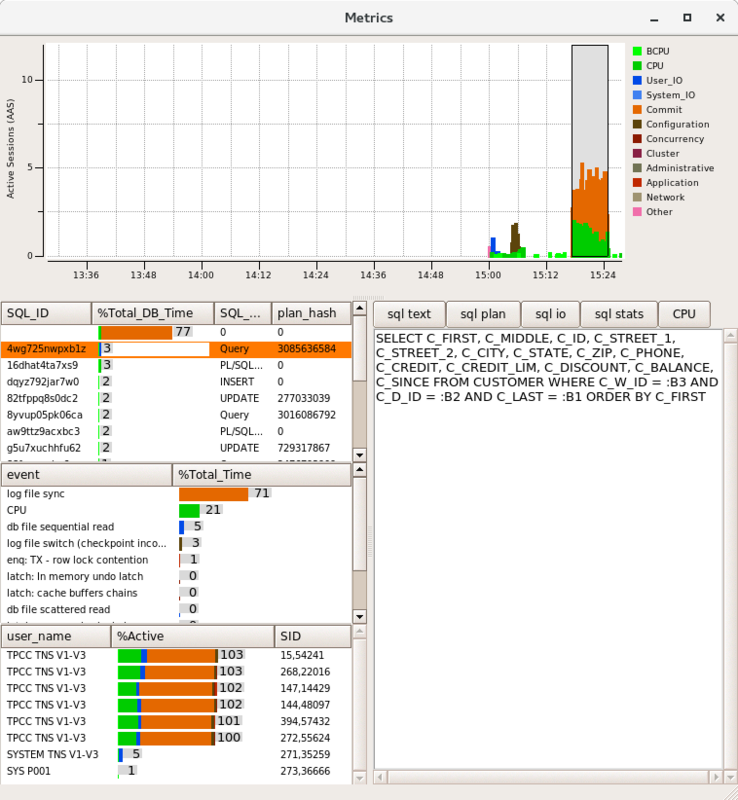 For more details on MySQL and optimization see the website by Dimitri Kravtchuk. It will return to the prompt when built – then restart the MySQL instance and run a single test. On an up to date system around mid-2018 expect to see up to 2M MySQL TPM and around 650K NOPM. 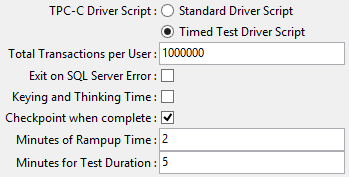 Then on a load test client run a script such as the following at the command line this does the same as autopilot in the GUI so make sure you log to temp. Grab the TPM or NOPM from the logfile. If everything went well you should get a sequence as follows peaking at around 650,000 NOPM on an up to date system in mid-2018. To be clear this chart shows the data from 20 performance tests, each with a 2 minute rampup time and 5 minute test. 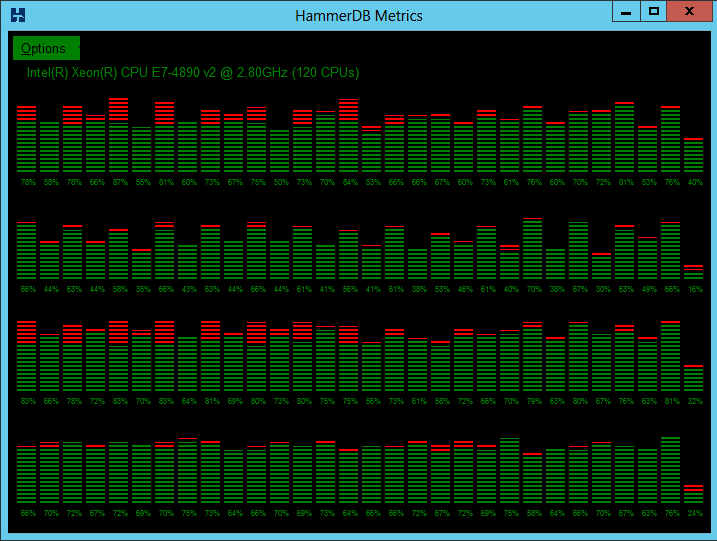 After each test completed HammerDB then increased the virtual user count and repeated the test. 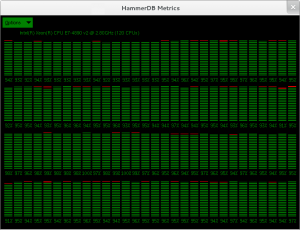 Fortunately HammerDB allows all of this process to be automated. Each data point shows the average transaction rate captured over the 5 minute test so not the peak performance that may be higher. 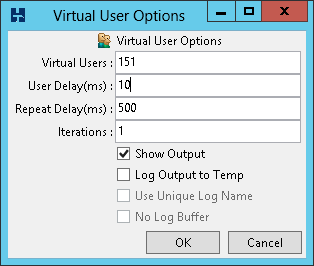 Note that after a point, in this case after 56 virtual users, performance will decrease as you increase the number of virtual users. This is to be expected and is due to the limitations of the scalability of the storage engine. If you report the stored procedure response times (see the HammerDB manual for how to do this) you will see the time increase especially for the DELIVERY stored procedure that is updating the ORDER_LINE table while the NEWORD stored procedure is trying to insert into it. As a result the NOPM or New Orders per minute reduces as more contention is experienced. This is not a limitation of HammerDB that has been observed to drive significantly higher transaction rates. 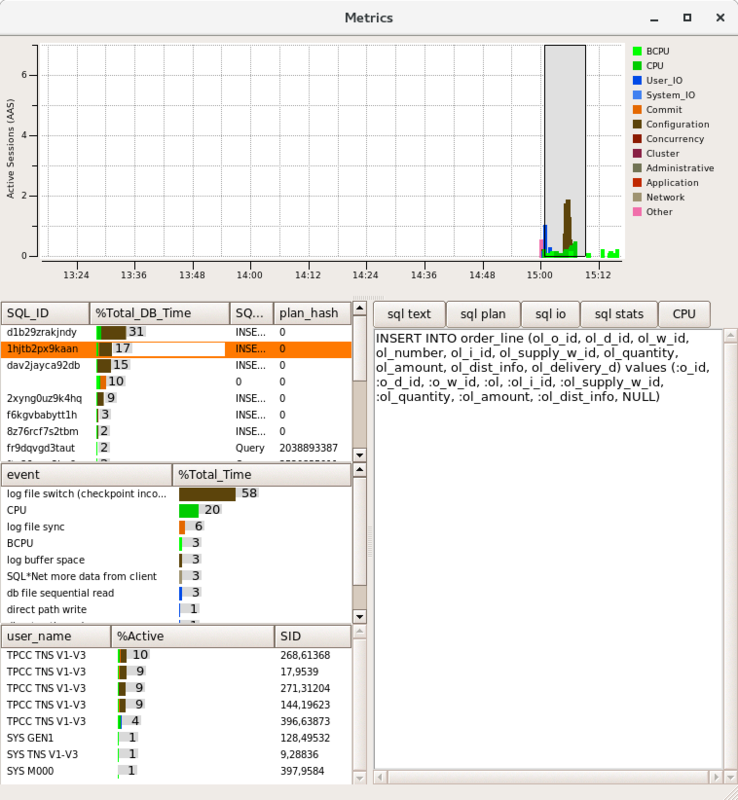 Nevertheless around 2M MySQL TPM is very respectable throughput for an enterprise workload and as there is a lot more CPU available the potential is there to go a lot higher.